Scandinavian style of the interior, promoting simplicity and functionality, originated in the middle of the last century. 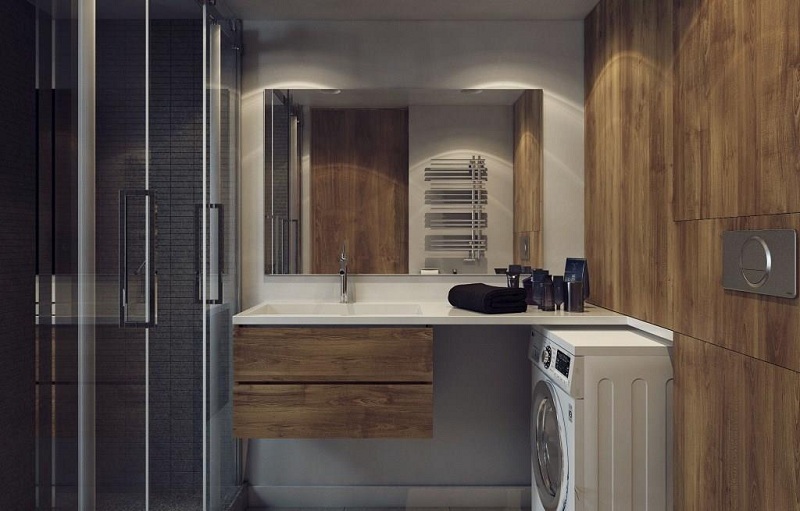 Its conciseness, natural shades, and materials could not be better suited for the design of domestic small apartments and, in particular, toilets. 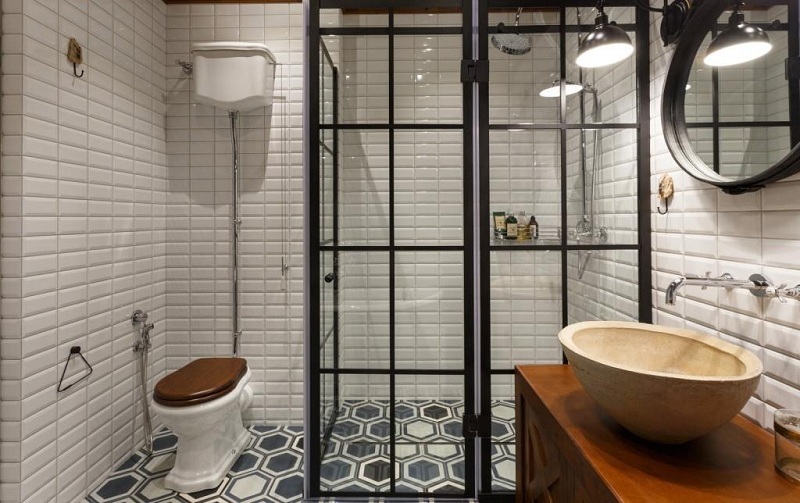 Design a bathroom in the Scandinavian style – it is fashionable, comfortable and beautiful without frills. A small amount of the most necessary furniture of strict geometric forms. 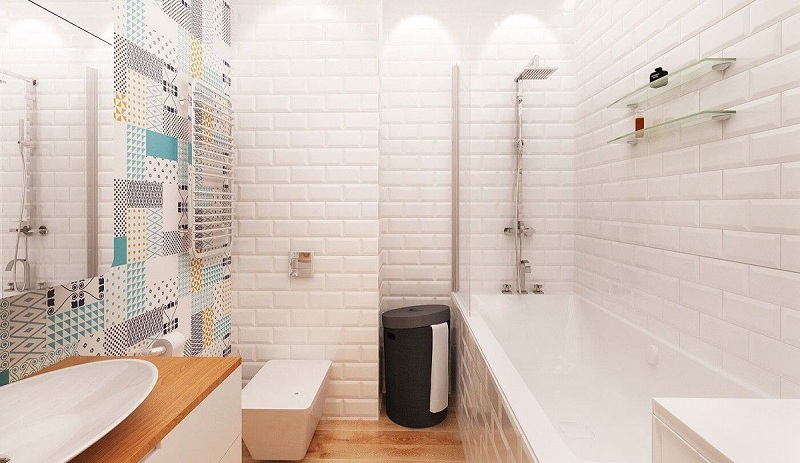 Adhering to these rules, taking into account domestic realities (the size and layout of apartments), you can easily implement a bathroom design in the Scandinavian style, beautiful, bright and comfortable. Since the climate in Scandinavia is rather severe, and the number of sunny days per year is small, the northerners are trying to decorate their homes in bright colors, compensating for the natural lack of design tools. That is why the Scandinavian-style interiors are dominated by white, creamy pastel, gray, bluish shades. In some cases, black is used as an accent, as if it emphasizes the whiteness of the walls, floor, plumbing, framing and enhancing the effect of light and spaciousness. In other bathrooms, you can find black as the main, background color, but it is necessarily set off by a snow-white ceiling, tiles, and other details. Another popular tone among the Scandinavians is a deep blue tone, referring to the maritime theme. It is used for walls and furniture. Natural wood brown, yellowish, ocher-gray shades necessarily present in the interior of the Scandinavian bathroom. This can be a floor design, a stepladder in a corner, a tree saw cut as a stand, a shelf or a tabletop under the sink. The gray color of concrete, natural stone or its imitation is used to finish the floor and walls. Glass is used for partitions, as an alternative to textile curtains. Metal is presently dosed – in parts of sanitary equipment, frames for mirrors, various holders, wall sconces. 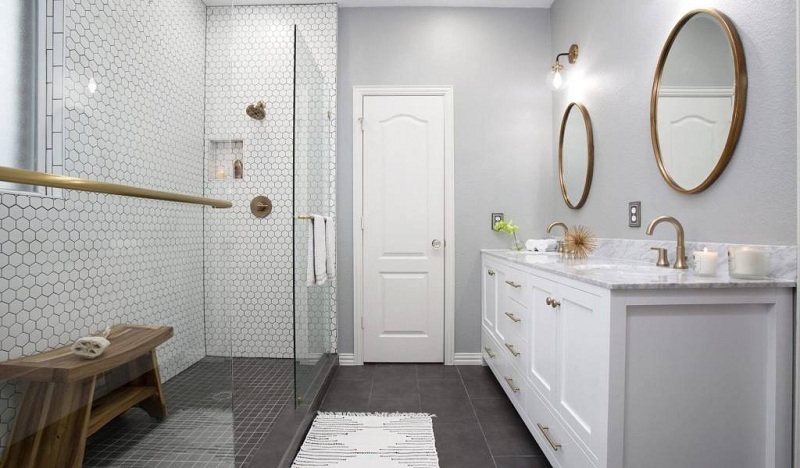 Chromed or matte surfaces in metallic colors prevail; retro style accepts brass, copper, as well as black taps, pipes, valves, and shower heads imitating cast iron elements. Greens – natural flowers and plants – are used as bright accents that enliven the space. They can make a company of yellow or blue, rarely pink or red accessories (textiles, bottles with dispensers). The bathroom design in the Scandinavian style accepts different textures, from smooth gloss to textile, jute and long-nap rugs of small size. 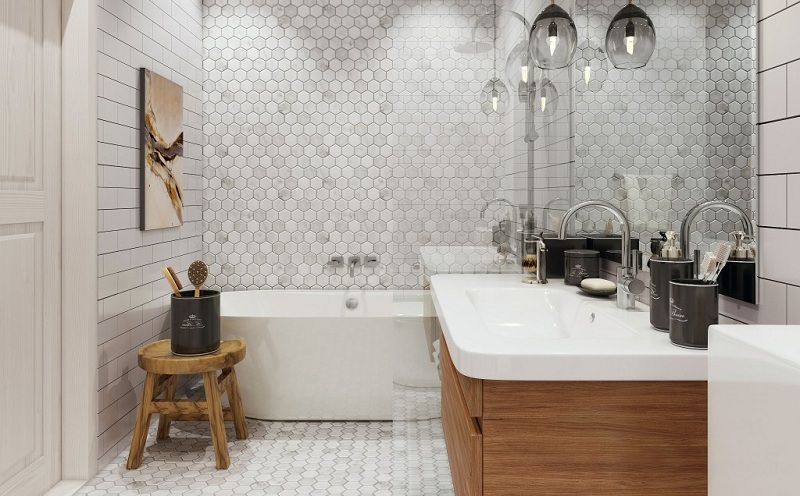 Tile of porcelain tiles, tiles on the walls and on the floor can be smooth and shiny, rough and matte, embossed, as close as possible in texture to real wood with all its knots, bumps, irregularities. Lighting is an important aspect of Scandinavian bathroom design. Since in our country there are rare bathrooms with windows, to compensate for the lack of daylight has an abundance of artificial sources. Ceiling lamps are usually made in the form of built-in fluorescent lamps, LED lights around the perimeter of the room are possible. To complement the ceiling lamps are designed wall sconces in the wash zone, on both sides of the mirror. In some cases, install two sinks with two or one mirror, then the number of lamps doubled. The spacious bathrooms require lighting and in the shower (in the bath area). The easiest way to solve the issue with the ceiling. It can be plain white plaster, paint, as well as a glossy or matte stretch ceiling with built-in spots. White, black, blue, gray paint, sometimes a shade of a sea wave or deep blue tone is used for wall decoration. The tile or porcelain tile can be laid from a floor to a ceiling or partially to a certain level. The shape of the hexagon (“honeycomb”) is very popular, as in the photo below, “bricks”, “hog”, diamonds and ordinary squares. 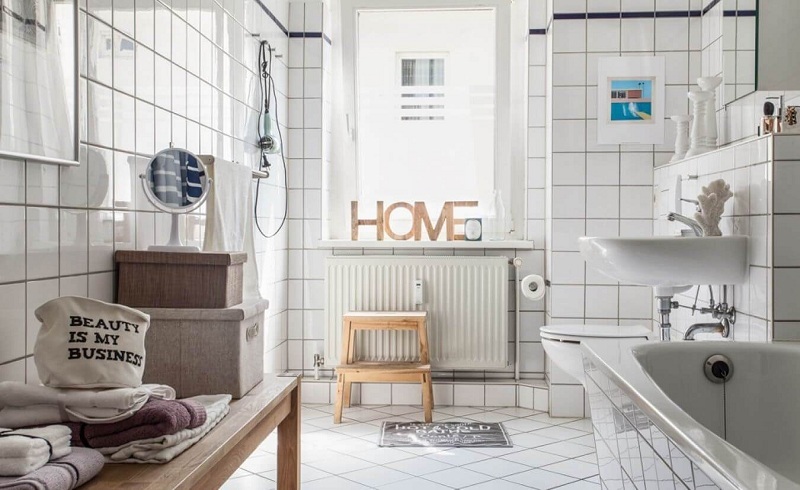 The Scandinavians themselves often use a contrasting black grout on white tile, which is beautiful, stylish and practical. The tile can cover only part of the wall in the wet zone, moving from floor to wall. 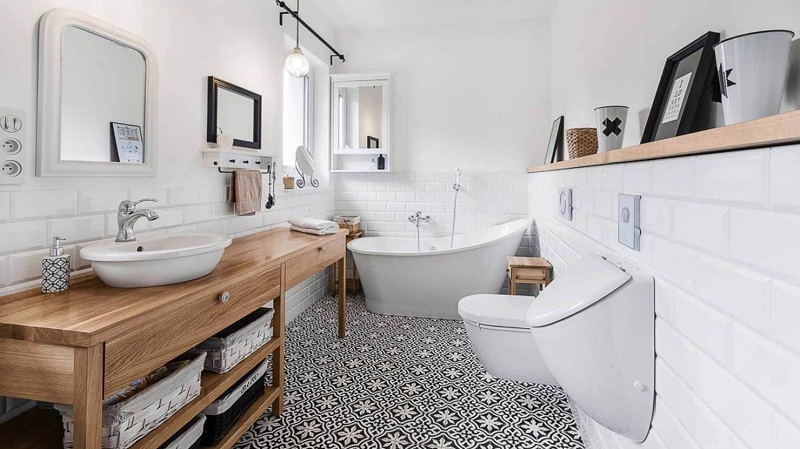 It looks great in the design of the Scandinavian bathroom floor tiles of porcelain stoneware, laid with offset. The tile imitating a natural stone, a concrete covering, walls and a floor of black color also stylishly looks. Colored and patterned tiles should not cover the entire space of the bathroom, the design of the pattern is used as an accent. It can be black and white or blue and white monochrome trim with a geometric pattern, laid in patchwork style, various motifs in the form of snowflakes, a coating that creates an optical illusion. Furniture for the bathroom in the Scandinavian style pick a classic, modern or vintage effect, but extremely functional. The mandatory set includes a cabinet under the sink of wood, chipboard or MDF. It can be replaced with a wooden or stone countertop with open shelves for various means. A washing machine, a laundry basket, and other necessary things will also be located here. Bathrobes and towels are stored on open hangers, hooks (you can have an unusual shape and design, for example, in the form of deer antlers). An ordinary wooden ladder, leaning against a wall, as in the example in the photo, will replace the hanger and shelving with shelves. 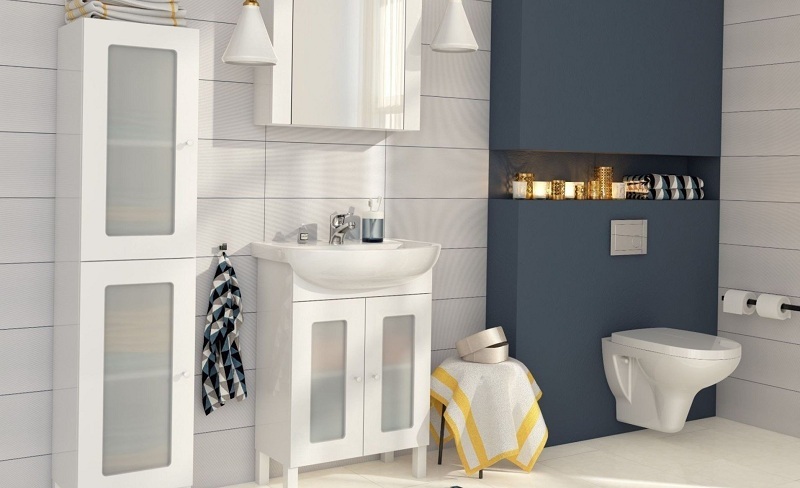 For a small bathroom, designers recommend the use of modern compact plumbing from white faience. Hanging toilet bowls and a bidet of streamlined shapes with installation, the same bowls of bathtubs and sinks are popular. 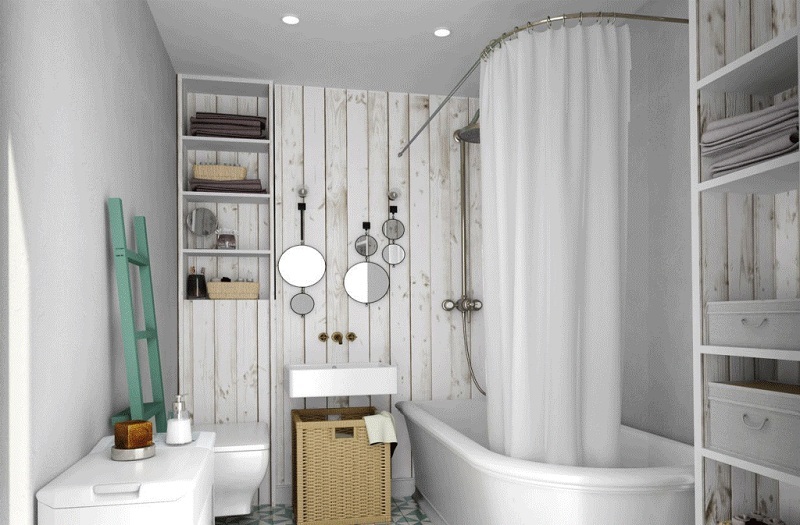 A faucet built into the wall will save you from unnecessary splashes and stains on the faience, and the shower compartment with glass partition, concrete will save space. By the way, Scandinavians often choose a shower with a drain in order to save water and time for hygienic procedures. 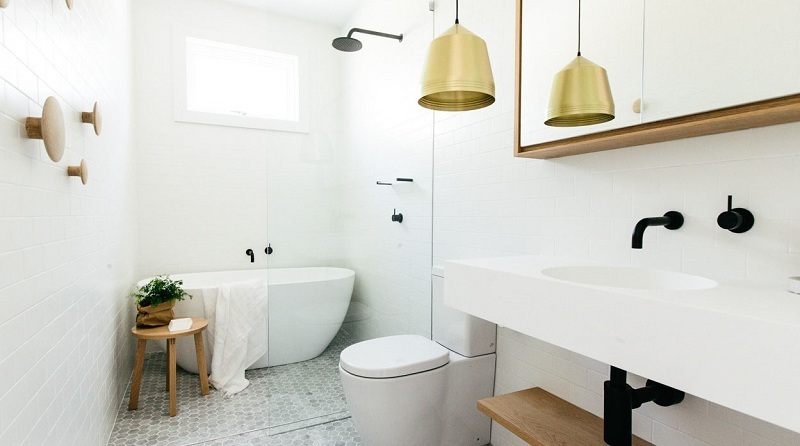 If you want to decorate the bathroom in retro-style, choose separate toilets with a top tank, with a wooden cover, brass, copper handles, and fittings. Similarly, sized taps, shower with a curved copper or brass watering can, a bathtub on curved legs complete the picture. No matter how laconic the Scandinavian style is, even it cannot do without a couple of bright accessories and colorful details, giving a cozy room. Often on the walls place family photos or beautiful views of cities, nature in a monochrome format, life-affirming or retro posters within. 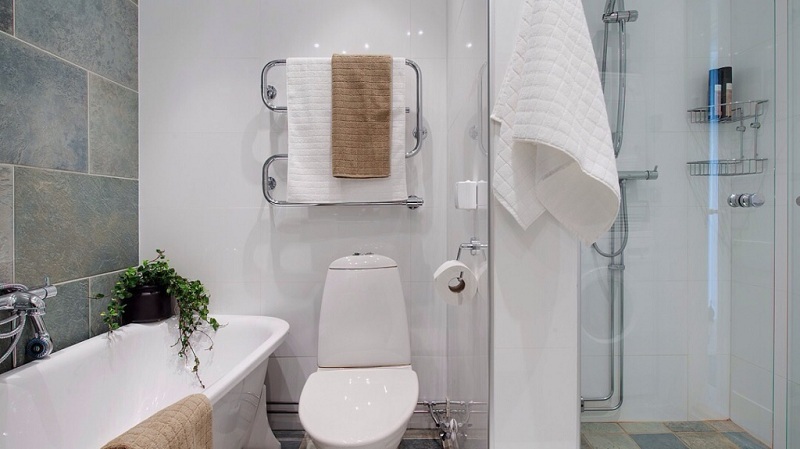 In addition to a single green plant in a pot or tub, the bathrooms are decorated with wicker of jute or colorful knitted rugs in a rustic style. A small rug with a long fluffy nap is also appropriate. Bath textiles are usually snow white, but if you want to somehow diversify the interior, you can use yellow, blue, dark blue patterned bathrobes and towels. Wicker and knitted baskets, boxes of jute, straw, rattan, and fabrics of natural colors are used for storing and placing accents. This can be a motley textile laundry basket, “packaging” for a pot with a flower. The main thing is not to overdo it with an abundance of flowers. There should be no more than three or four indoors: one is main, background (usually white or black, woody or gray), the second is his companion and the third is an accent, bright, used only in a few details. 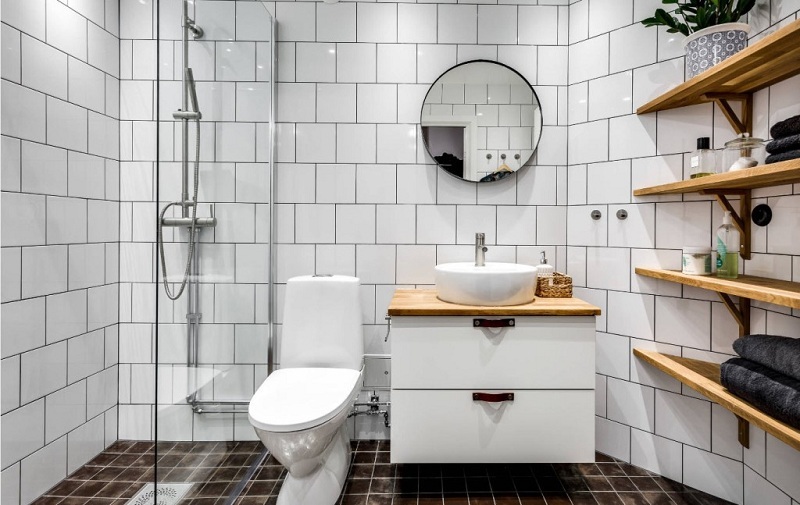 As you can see, it’s not so difficult to implement the basic principles of the Scandinavian style in your own bathroom. The interior will be concise, comfortable, practical, inexpensive and beautiful. Good luck in the renovation of the bathroom!